I used to use SeaPlasma for so many things. It was a great moisturizer that I could spray all over; my hair, my face, my skin, my clothes . . . it didn’t matter. Of course I didn’t spray it on my clothes to moisturize them, but when I sprayed it on me I was not worried about it getting on my clothes and staining them. I didn’t worry about it getting on my car’s upholstery or my furniture. It was a great way to “freshen” up when I had to go somewhere right after teaching Nia. I loved it and have been using it since Junior High. Sad, so sad, to say that it is not being made any more. So . . . I am always on the lookout for something comparable. I have found a couple of moisturizing products but they are basically made of oils so I don’t trust them on my clothes or furniture. I also don’t like to use them in my hair as they just make my hair oily. The other day, after posting about peppermint oil, I decided to make a mixture of my own. 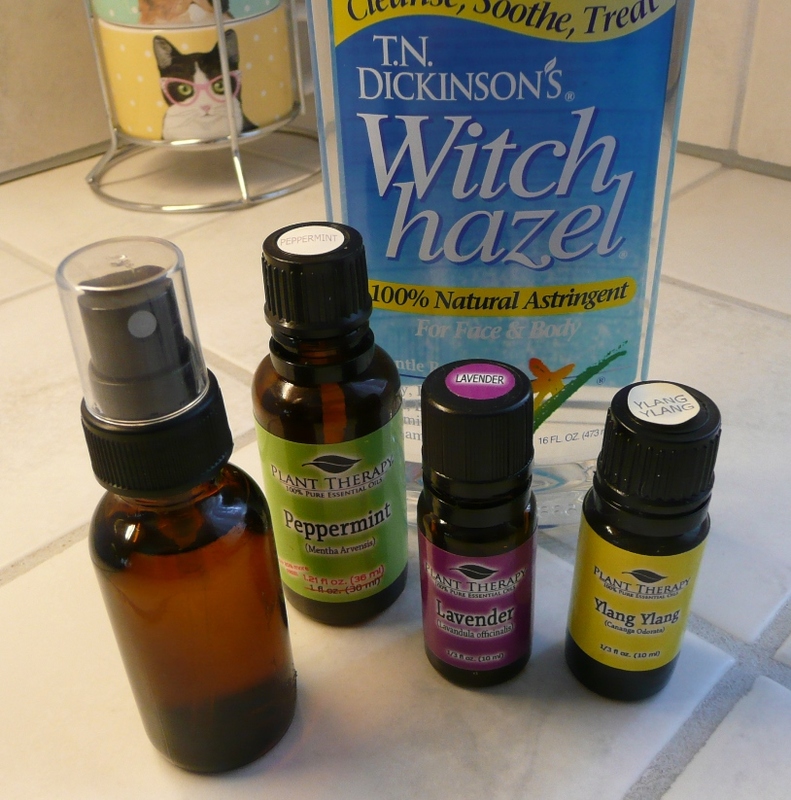 I had a little spray bottle and I filled it almost all the way up with witch hazel, I added a few drops of peppermint oil for its cooling properties. Since it can help with allergies, congestion, among other things, I thought it would be a nice addition. I put in a few drops of lavender oil primarily for its calming effects. And I put in some Ylang Ylang because I enjoy the smell and it can help with anxiety, high blood pressure and restlessness. I topped the bottle off with water. I thought this would make a nice mixture for cooling me down. I think it will not be drying and it smells nice. Witch Hazel is an astringent made from the bark and leaves of North American witch-hazel shrub. But even though it is an astringent it is not a harsh one. It does not dry out the skin, in fact it helps with moisturizing the skin and hair. I am not so worried about it on my clothes although I should probably test it out. For now I just have a bottle by my bed and it helps me get to sleep on those warm nights. I think I will make some more to use in replacement of my beloved-yet-no-longer-made SeaPlasma. I really love the smell! Fill the bottle almost all the way with Witch Hazel, then add about 7 drops of peppermint oil, 7 drops of lavender oil, and 3 or 4 drops of Ylang Ylang oil. Top of with water. Shake. As I said I have not tested this on clothing or furniture so be cautious. Also, this is just a loose recipe and IDEA of what to do. Add more or less oil as you see fit . . . do what works for you. Do you have a recipe for a refresher?